Click here to read the article and find resources to deal with Seasonal Affective Disorder. Baby It's Dark Outside: My article for Discorder Mag on S.A.D. Click here to read the whole article and see all the illustrations. Apparently, depression and suicidal thoughts are normal side effects of moving to Vancouver. The doctors would tell me they see it all the time: someone moves from a city with winter, spring, fall and summer to Vancouver, the city with thick grey skies and rain for ten months of the year, and suddenly they lose the will to live. It’s called Seasonal Affective Disorder (aptly abbreviated as SAD) and when you live in a city that barely has two seasons, it becomes a big deal. Vancouver is a city full of SAD people for most of the year. According to the medical community, we have a full-blown SAD epidemic. Obviously, if I had answered yes to that first question, there would be no need for me to visit every waiting room in the city. Unfortunately, I’m from Surrey. I grew up with this constant drizzle. My dad used to say that the rain would follow us if we ever went on a vacation, so part of my little kid brain thought that my family must also be the reason it rained so much in the Lower Mainland. I’d tell the doctor that no, I was not some previously happy East Coast Canadian who made a terrible mistake and moved to the “wet” coast, and we’d move on from that question to the next one. 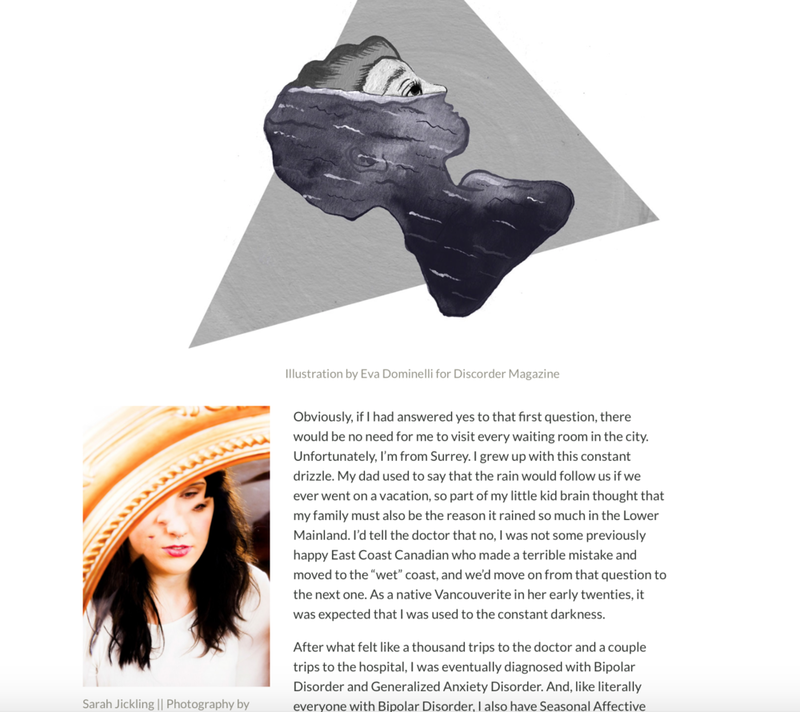 As a native Vancouverite in her early twenties, it was expected that I was used to the constant darkness. After what felt like a thousand trips to the doctor and a couple trips to the hospital, I was eventually diagnosed with Bipolar Disorder and Generalized Anxiety Disorder. And, like literally everyone with Bipolar Disorder, I also have Seasonal Affective Disorder. But on my list of problems, SAD ended up at the bottom of the list. I spent years trying to find the right medication that would treat my bipolar disorder without worsening my anxiety disorder, and finally I could get through a month without throwing a plate across the room or sleeping for fifteen hours straight. It was August 2016 when my psychiatrist and I agreed that I was doing well enough that I could go three months between visits instead of the usual two weeks. I finally felt okay. And then October came. I’ve been stable on meds for a year and a half, and while that doesn’t make me an expert, I’ve learned that from October to May, life is harder. By the time pumpkin spice latte season comes around, my symptoms of depression come creeping back like clockwork. I’ve tried everything my doctor (and the collective hive mind of the internet) has suggested to fight it. I have a little happy lamp which I try to stare into for 30 minutes every morning. I take more vitamin D than the bottle suggests. I try to have fun with the fall and winter holidays. Last year I bought tickets to the Halloween train in Stanley Park, Zombie Syndromethe outdoor interactive zombie play and the “no splash zone” at Evil Dead The Musical. I went to the pumpkin patch, the Christmas market, the other Christmas market, a Christmas-themed musical, saw the lights at VanDusen Garden and if my money hadn’t run out, I would have bought tickets to a Christmas ghost tour of Gastown. It was ridiculously hard work, and as October came rolling around this year, I didn’t have the energy (or the money) to throw myself into celebrating cozy, fuzzy feelings that only ended up feeling forced and hollow. This year, instead of trying my best to have fun, I’m going to try my best to take care of myself, even if that means allowing myself to feel depressed. Instead of spending my money on overpriced Christmas markets, I’m going to make sure I exercise (I can be found at the local pole fitness studio almost every night), eat food at least three times a day, drink water, and sleep eight hours a night. I’m going to say no to projects I can’t handle, or postpone them until the summer when I have more energy. I’m going to expect less of myself. Bears hibernate. Maybe people with SAD need to hibernate too. To everyone who struggles with their mental health this time of year, I would like to remind you that Christmas doesn’t have to be joyful, New Year’s Eve doesn’t have to be exciting and Valentine’s Day doesn’t have to be romantic. You don’t have to pretend that this is the “most wonderful time of the year.” You have to take care of yourselves and make sure you survive until summer, no matter what that means to you. Maybe one day, we can all move to the south of France. But right now, we’re here, and we’re having a hard time. And that’s okay. Sarah Jickling is a Canadian songstress and mental health advocate. Over the past few years, Jickling’s whimsical indie-pop songs have been featured on radio stations across the country and in independent films. The twenty-six year old uses her music to spread mental health awareness, and has opened up about her experiences with Bipolar Disorder and Anxiety Disorder on radio, local television, podcasts, blogs and at live speaking events. She now performs her music in high schools across the province with the BC Schizophrenia Society’s Reach Out Psychosis Concert Tour. She can be found in hospital waiting rooms and pole dancing studios around Vancouver. To speak to a psychiatrist or join a coping skills group, ask your doctor or a walk-in clinic to refer you to the Mood Disorders Association of BC. If you are feeling suicidal and are looking to see a free counsellor immediately, contact SAFER at Vancouver General Hospital. If you are looking for an extremely affordable counsellor and don’t mind being on a waitlist, contact Oak Counselling. To learn skills about mindfulness and other coping tools for free, email the YMCA Youth Mindfulness Program and ask to be put on their waitlist (for people under 30 only). If you need to talk to someone, or to find more resources in your area, please call the Crisis Centre or chat online with the Crisis Centre Chat (for over 24 years old) or YouthinBC.com. If you are in a crisis and you don’t want to go to the ER, there is now a mental health emergency centre called the Access and Assessment Centre. They can send a nurse to you and have counsellors and psychiatrists on site. Some helpful mental health apps include: Wysa, Calm, Headspace, Mindshift, and an app in progress called Aloe.